David Weinberg Photography is pleased to announce the opening of The Lure of Sirens, a new series by David Weinberg. In the back galleries, The Coat Check is presenting Natural Deceptions, a solo exhibition featuring new works by Chicago-based photographer Natalie Krick. Both of these exhibitions speak to congruent themes of sexual attraction, the seduction of imagery and notions of beauty, which are independently complicated perspectives and of disparate positions as makers. These exhibitions open with an artist’s reception on the same evening, July 12th, 2013 from 5-8pm. David Weinberg’s work often oscillates between the genres of narrative and abstraction. He is enchanted by separate worlds, one of mercurial representation, where people and objects become disfigured and misshaped. The alternate is based in a method of storytelling, containing loosely weaved characters, settings and fragmented events. It is in this new series that David Weinberg has consummated the two spheres, guiding his pictorial narrative to a new depth of the lyrically nonrepresentational. The Lure of Sirens stages a nonlinear narrative within a series of distorted images that aims to arrest the viewer in its epic scale and fluidity. The photographs themselves being the largest works Weinberg has made to date. 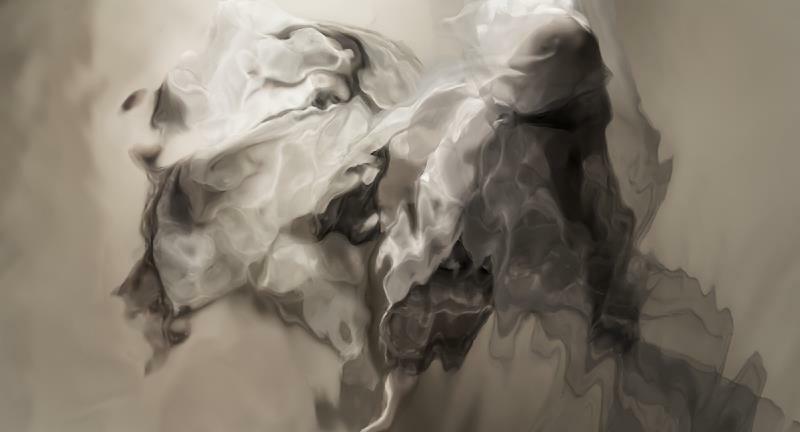 Through a process of photographing reflections in motion, the images begin to depict figures which emerge through spiraling color that evokes the fabric of a lover’s bed. These distorted forms recall nostalgic passion and distant fantasy. The enormous photographs float off the walls suspending the room in it’s dream. Weinberg utilizes abstraction to serve as a barrier between desire and the tangibly real, this critical distancing then creates a surreal landscape of mythic lust. David Weinberg is a Chicago based photographer whose work explores abstraction, narrative and portraits of global cultures. He is continually inspired by the lives of others, hard work and the ephemerality of memory and being. His work has been featured at venues such as the Elmhurst Art Museum, Art Chicago, Loyola University Museum of Art and the Field Museum in Chicago. Natalie Krick has been making large-scale sexualized portraits of her mother for two years, knowing that so much of making a portrait is a disguise. She masks her mother in the garish poses of celebrities, behind the make up of starlettes, dressed in wigs that mimic women from a magazine 30 + years younger. It’s an act of concealing in an attempt to confuse and then question or reveal. What these pictures unveil is more than a simple illustrated contradiction. They speak to a personal account of the performance of femininity and a perspective that is butted up against the tropes of feminine beauty and sexuality in visual culture. Via the deceptive nature of portraiture Natalie presents us with complicated framings of identity, be it a learned progeny of genetics or culture. Her photographs are undoubtedly beautiful, yet when the facade of bright colors and hot flash are stripped away the image begins to uncover an unorthodox subject and an uncanny sensibility. This residual tension, the thing that which makes the images off putting is the markings of cultural conditioning whose origin is ubiquitous and unknown. Through the repurposing of these tropes which are presented again as pretty pictures the artists subtly confronts an on-going inner conflict that has been experienced by feminists for ages; to simultaneously recognize the problematic nature of how feminine sexuality and beauty are projected and yet still be seduced by it’s spectacle. This work embraces artificiality as it continues to question the fantasy of idealized beauty. In more recent images, Natalie has begun to incorporate self-portraits as an act to further complicate the role of identity and notions of autobiographical fiction. Natalie Krick (b. 1986) is a Chicago-based photographer whose work is fueled by her fascination with popular culture, beauty as it is seen by fashion and the clichés thereof. She has most recently exhibited in Chicago at Johalla Projects in the group show Archetype Drift and the 16th International Open at Woman Made Gallery, also here in Chicago, IL. This year she is an artist in residence for the South Logan Arts Coalition, a non-for-profit organization which grants studio spaces to artists in storefront spaces located in Logan Square with publicly promoted open studio events. She is the recipient of the Albert P. Weisman Award in 2011 and again 2012. Natalie received her BFA in Photography from the School of Visual Arts, NY in 2008, and her MFA from Columbia College Chicago, IL in 2012. Please come and join us in celebrating the opening reception on July 12th, 2013 from 5:00 til 8:00 pm, at David Weinberg Photography, 300 W. Superior St., Suite 203, Chicago, Illinois 60654. Please contact Matt Avignone for High Resolution Images for Print. Copyright © 2013 David Weinberg Photography, All rights reserved.